The prominence of the old city of Calcutta (now Kolkata) in India can be traced back to the late seventeenth century. Not surprisingly there are abundant buildings that were constructed before the 1800s. With growing time, the city has also become quite the canvas for natural growth on buildings. Wild growth on buildings can be beneficial for utilitarian as well as aesthetic purposes. 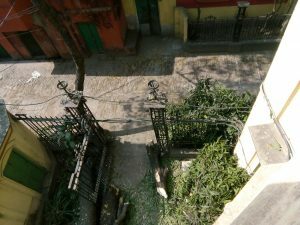 A tour of the old city of Calcutta reveals that while biological growth can threaten to destroy buildings’ structures, conservation and management of growth can also enhance the age-value and identity of the city. Thus, the existing character of natural growth on built structures gives Calcutta even a unique opportunity to enhance its historicity and charm. Trees or shrubs growing on buildings can be dangerous for built structures. Root action on walls and weight of trees can cause cracks compromising the safety of the residents in the building. Other times, the roots may not compromise security, but still cause critical damage to structures like under-ground water tanks, paved paths along the roadsides or even piping below the surface. The mango tree at Beadon Street had long served the residents of the heritage home with fruits as well as shade. 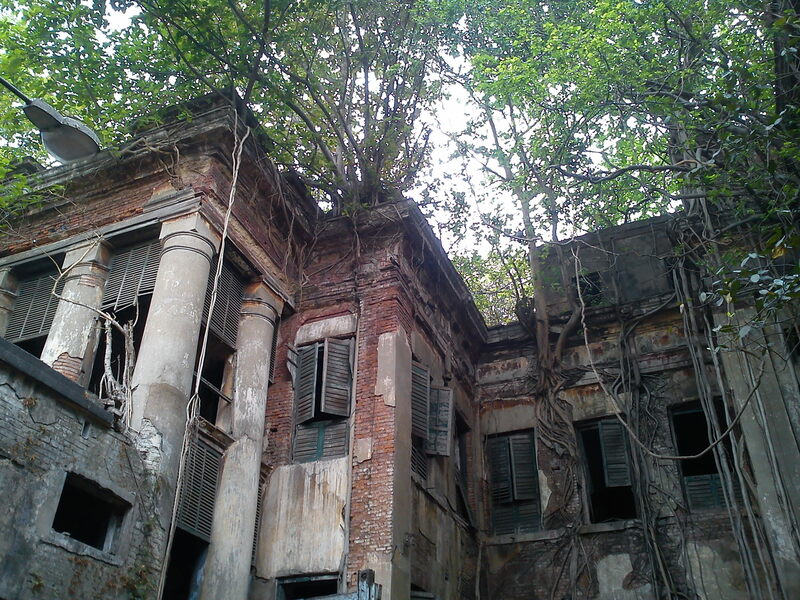 After 45 years, it had to be chopped down for its roots had extended to not only crack the walls of the building, but had also penetrated the underground water storage tank to cause massive water leakage. Then a tree with root system that penetrates deeper (tap roots) as opposed to a root system that spreads could have been more desirable for the location. Indeed, during landscaping, due considerations to substructures are as important as superstructures – especially given the vast network of sub-soil infrastructure in urban areas. Vegetation can add value to buildings even without causing serious damage. Plant species such as moss, lichens, ivy and creepers increase the historic appeal of buildings, and are desirable to that extent. 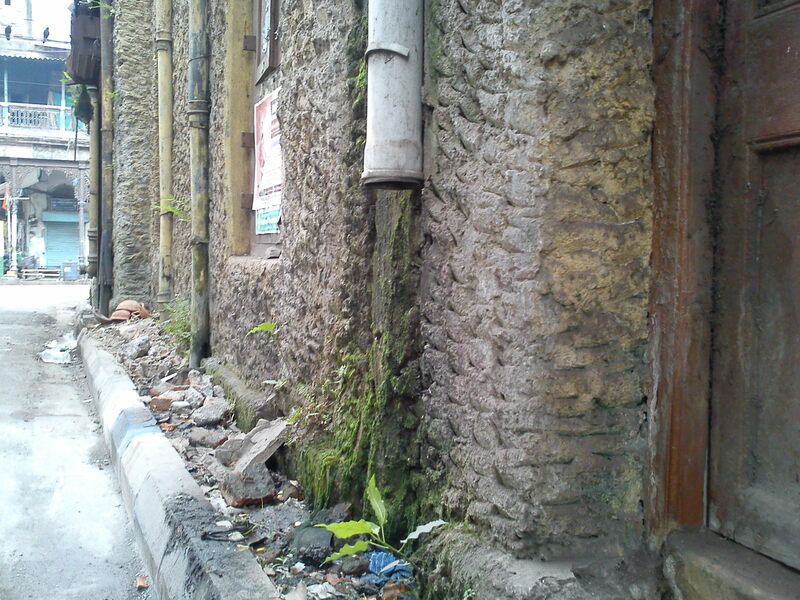 Old Calcutta offers several examples where the drama on the built façade is only increased by the superfluous growth of ivy and climbers that twirl around pipes and grow along ledges. But creepers and are by no means harmless. They prevent moisture evaporation from buildings and can penetrate walls to displace masonry. While such damage is less threatening structurally – as compared to root action of larger trees – it is nevertheless not desirable for living conditions. One way of incorporating the aesthetic effects of ivy and creepers can be done by creating space between the wall and the plant. A popular practice uses trellis mounted on walls that allow climbers to grow on it not needing it to come in contact with the wall surface, thus reducing the aforementioned harmful effects. Similarly, while mosses and lichens are commonly held to add to the historic and aesthetic value of buildings, they too can retain moisture that leads to frost or water related damages. 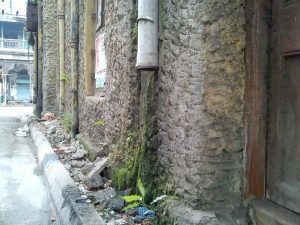 Moss growing on boundary walls or thick masonry of the colonial buildings does not seem to conflict with human safety or building health. However, in buildings that are more susceptible to damages, moss can be removed physically or by using manufactured products. Thus, while biological growth in habitable parts adds to the aesthetic value of urban structures and spaces – there is an effective management that is required to mitigate conflicts that arise for human health and building structure. The urban comprises of inhabitable and un-inhabitable structures. Buildings with heavy biological growth that are currently un-inhabited offer unique potentials for re-appropriation of use. 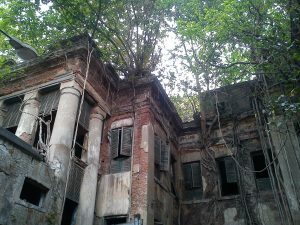 The old city of Calcutta has several buildings, colossal in size, that are heavily invaded by huge trees and their roots all over the building. It would appear that structures such as that of Jora Bagan police station have fused with the trees growing on it. Rooting out these trees would result in severe damage to the building surfaces and structure. All wings of the building are abandoned reflecting that restoration by removal of undesirable biological growth has not been deemed as practical. But to think again, this setting has created a scene for the urban wild; and to that extent, even an interesting story-telling and identity associated with the city’s old age. 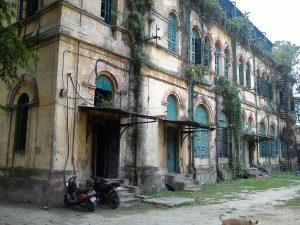 Conservation efforts of key structures such as the Jora-Bagan police station; can be instead to retain the unique setting created. 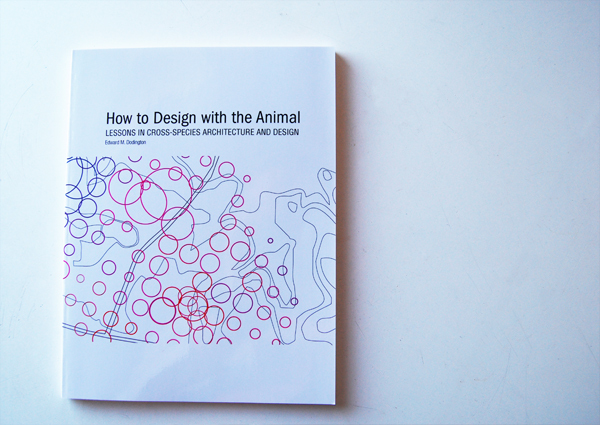 The building can be transformed for public experience of urban wilderness by retrofitting and refurbishment; and thereby creating a new typology of space that monumentalizes both urban-wildlife habitats as well as historicity. Wild growth can be a resource, albeit mostly incidental, and therefore rare. 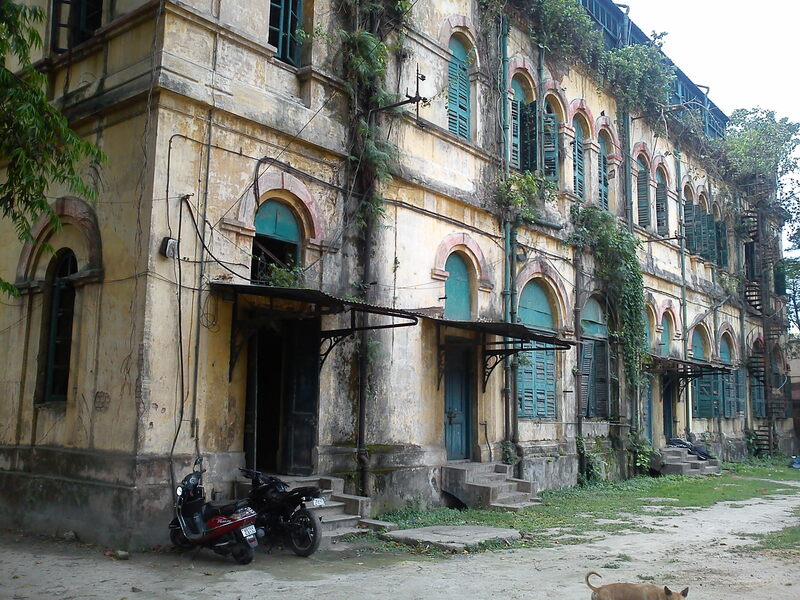 The city of Calcutta is a paradise for those in love with colonial architecture. 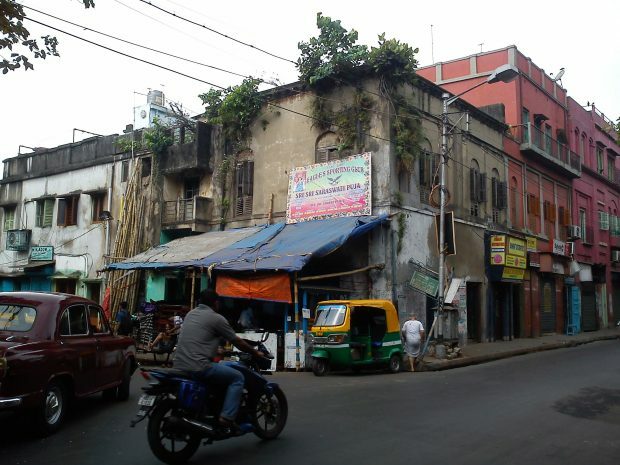 Wild biological growth that has emerged on Calcutta’s buildings with age has the potential to enhance the city’s heritage quotient, if appropriately exploited. Wild growth can be a resource, albeit mostly incidental, and therefore rare. As this ‘resource’ depends on typical micro factors like climate and existing architectural fabric of the city –if protected and nurtured can project the local identity in a unique way.